Camp is packed full of so many fun activities. While part of my job is to think of new and exciting activities to bring to camp, we have often looked to campers for inspiration as well. From interviews, to camper’s evaluations, to conversations, we want campers to have a voice. If a camper has a creative vision, we’ll run with it. I imagine this is how the pillow log came to be, and it’s exactly why we installed an archery range. Kids after all have the best imaginations! This year we are putting on our second consecutive special theme week that looks different from the usual Vermont summer camp program. We chose the title UbuildIt. We are harnessing the imaginations of 50 or so campers to create a very fun and interactive week. Campers will be able to pick their favorite activities when they register. We will plan the week based on these choices. 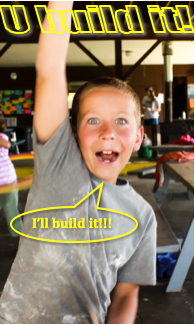 Campers will even have the chance to modify existing activities for each other. Some of the favorites up for modification include Mission Impossible, Pig Trough, Slip N’ Slide, Camp Cinema, Group Games. So often in this day and age we see young people relying on social media, screens and apps to entertain. This favorites UbuildIt week is going to turn this model upside down and challenge campers to get involved in making the fun! We couldn’t be more excited to see what they come up with. Are you joining us this summer?